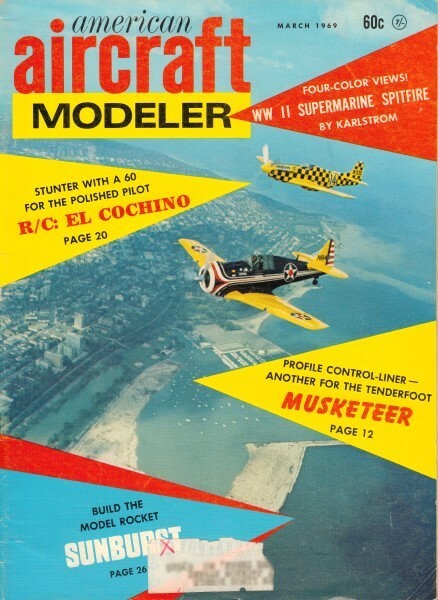 Website visitor Jim P. wrote to ask whether I would scan the Tenderfoot article in the March 1969 American Aircraft Modeler for the Musketeer, a 1/2A profile control line model for beginners. Mr. Jim Davis designed the model and drew the plans. Beechcraft's biz-and-sport plane makes good controlliner trainer for 049 engine. Plan is full size[originally]. THE Musketeer, a common sight at local airports, is a popular craft for business or sport flying and flight training. In a model, a good trainer usually must depart from scale because of the necessary change in nose and tail lengths, and the proper location of the C.G. (center of gravity). In this case, the Musketeer fuselage is a near-perfect scale profile. 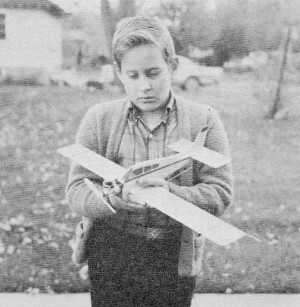 Only the wing and stabilizer area had to be changed to obtain gentle flying characteristics. The Musketeer model construction was made as simple as possible to keep beginners' problems to a minimum. The secret of a good flying model is proper alignment; in this case, most of the construction is done on a flat board. Do a neat job putting on trim and decorations and your ship will gain respect at any flying site. Note muffler. Won't miss noise! Proper alignment is important on any flying model. With wing laid flat on the building board, the stabilizer is lined up. It is easy to glue fin on straight if you sight carefully along fuselage after ship has been placed flat on your building board. 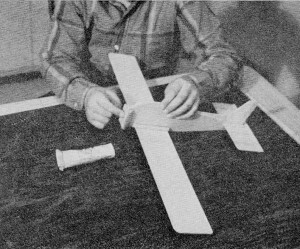 The plywood firewall (motor mount) is glued against front of fuselage. Note the sturdy supports and the wing fillet pieces. If landing gear is used, strut clamps in place between engine tank and motor mount. Detail of engine mount. 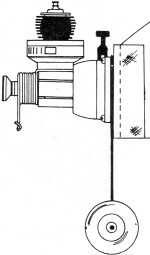 Washers tilt engine thrust-line toward the outside of circle. hinges will break in a crack-up than if cloth is used. This hinge method was used for years by the author for emergency repairs when flying in combat competition. The plans are full-size. Instead of cutting up your magazine, take a sheet of tracing paper and tape it to the magazine page with masking tape, then carefully trace the parts. The tracings can be cemented to the wood with rubber cement, then cut out. If you have access to a jig saw or band saw, it will be easier to cut out the 1/4" fuselage side. Make sure all the parts are cut accurately since they key together and align themselves. The tracing paper can then be peeled off and the remaining cement rubbed off with your finger. The wing is made of 1/8 x 3 x 24 balsa. Mark the center of the piece (12") and place the center portion of your tracing there. 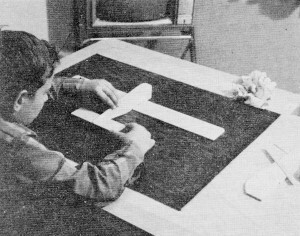 The tracings for the wing tips are then placed at the ends of the balsa piece. If you think the wing has an odd shape, take a look at a real Musketeer. It has the same shape. 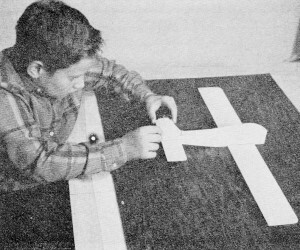 Pin the wing down to a flat board, then apply cement liberally to the center of the wing and set the fuselage in place. Add the 1/4 x 1/4 x 3 fillets to each side and hold in place with pins. Use a small triangle to be sure the fuselage is exactly vertical. Apply cement to the center of the stabilizer and slide into position in the fuselage slot. Use your triangle again to be sure the trailing edge of the stabilizer is at right angle to the fuselage. Measure the distance of each tip down to the board to be sure they are the same. This is to be sure the stabilizer is parallel to the wing. Add the two pieces of 1/8 x 1/8 x 2 fillets. Cement the three vertical fin parts in place. If desired, the trailing edge of the rear piece can be offset 1/8" to the right to give better flying-line tension. Apply cement to the back of the plywood firewall and also to the two 1/2" triangles and set them in place. Hold with pins. Be sure the firewall is up tight against the front of the fuselage. Cement one of the 1/16" plywood pieces to the top of the wing at the bellcrank location. After you are sure all of the cement is dry, remove the model from the board. Cement the second 1/16 plywood piece to the bottom of the wing. Cut a 2 x 4 strip of ordinary gauze bandage and cement it to the front of the firewall and around the sides. This reinforces the engine mount. Coat the top of the gauze with cement. It would be best at this point to allow everything to dry overnight. Then begin painting. Since your Musketeer is being built for flying, not for appearance, keep the painting to a minimum. The fillets on the wing and stabilizer can be carved to triangular shape or left square. First, sand all surfaces and round all edges with fine sandpaper or 6/0 garnet paper, then apply a coat of clear dope. After it dries, sand lightly and apply two more coats of clear dope. When dry, apply the color dope. Since the wing is a long, flat sheet, the shrinking qualities of the dope may warp the wood. To prevent this, paint only half of one side then the entire other side; finally, paint the remainder of the first side. If a warp should develop, hold the wing over an open pan of boiling water and let the steam penetrate the wing. Do this to both sides then pin the wing panel down to a fiat board. After the final coat of dope has dried, the controls and engine can be installed. 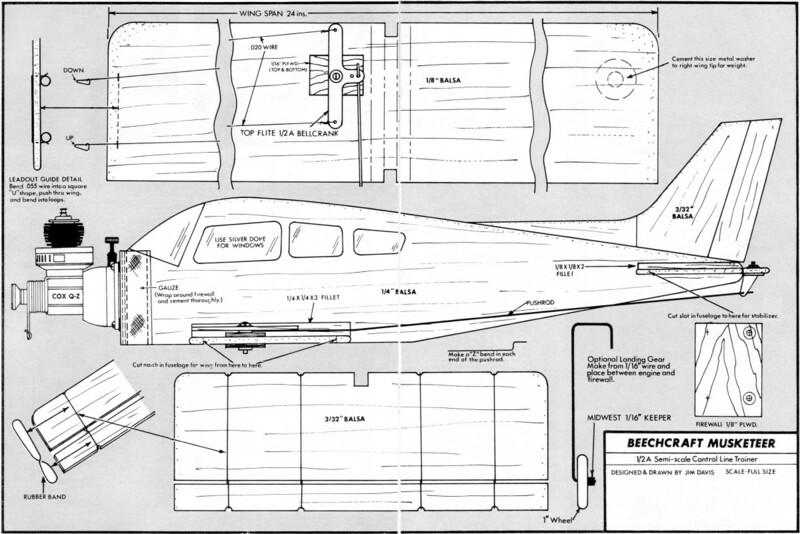 Mount the horn in the elevator then bend the pushrod, using the fuselage side view on the plan as a guide. Insert one end of the pushrod into the horn and the other end in the outer hole of the bellcrank. Set the bellcrank on the platform 1/16 plywood) and mark the location of the mounting screw with a pencil. Drill a 3/32 hole into both plywood pieces and wing. Bend loops in the leadout wires and attach to the bellcrank. Mount the bellcrank in place. Bend the wire leadout guide as shown on the plans and insert the leadout wires through it. Cement a metal washer to the bottom of the wing on the right side. This counterbalances the weight of the flying lines. Instead of a metal washer for weight, you can use 1/4 oz. of modeling clay. Use #3 wood screws to mount the engine. Place a #3 fiat washer between the two left engine mounting lugs and the firewall for engine offset. This points the engine slightly to the right towards the out­side of the flying circle) for proper line tension. If landing gear is used, two wash­ers may be necessary. If you care to have a landing gear, one can be made from 1/16 music wire and mounted between engine and firewall. The landing gear is an optional feature mainly because it is difficult to take off on grass with a small model, while concrete will allow a takeoff but can cause severe damage in a crack-up. Therefore, grass is the preferred surface for a beginner. If grass, the model would take off by hand launch. When ready for takeoff be sure the elevator is neutral, then have your helper run with the model with the nose pointed level and slightly to the right. He should also be keeping the lines tight. Have him run until the model flies out of his hand and you be ready to step back if the lines go slack. Let the model fly by itself and you correct the level of flight only when necessary. Most beginners will tend to over control. To prevent this, hold your arm straight out and raise and lower your whole arm instead of using your wrist to control the model. Above all, don't be afraid of a crack-up. If your model hits the ground, pick it up, dust it off, and try again. Any damage can be easily repaired with a little cement. Your model will last a long time because of its simple, wood construction. 1 battery cord and clip.